Part of my apprenticeship, has been learning how to run the lunch program for our son’s school. During the previous school year, I shadowed Chef Husband in the kitchen. That experience is what precisely prompted me to start learning more about how he does things as a professional chef. This school year, I have been pushed out of the nest and I am officially the lunch lady.I have been walking a mile in Chef Husband’s shoes, learning how to write a menu based upon multiple factors, scheduling a crew and training them, ordering and procuring food stuffs, keeping track of food costs and inventory, lining out the timing in order to make it all happen on the school lunch schedule with prepping, cooking, and serving, all the while making sure the kitchen is properly maintained. Whew! 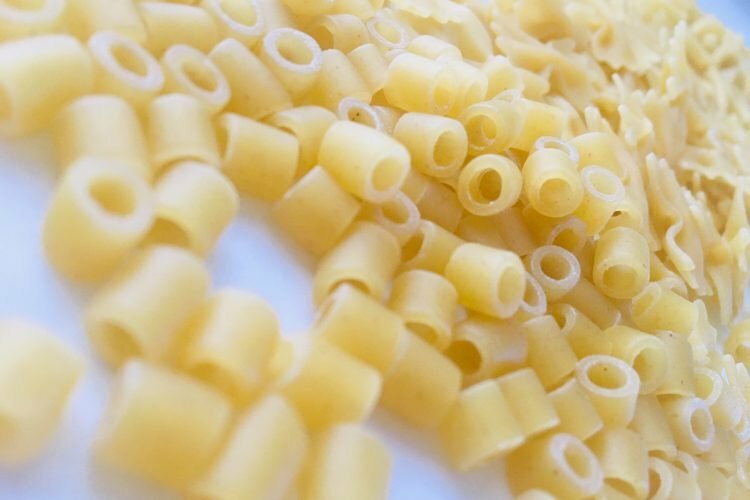 Now I truly know why the restaurant business is so exhausting, but at the same time, a fun challenge.In the kitchen, most recently, I was prepping seven pounds of elbow macaroni noodles for the next day’s lunch service. I was planning to introduce a new menu item to the kids, called Macghetti. It was something that I grew up with, which is basically spaghetti, as you would know it, but substituting elbow macaroni noodles for the pasta. As I prepared to dump the macaroni into the water, Chef Husband stepped in to make a couple of adjustments to my system. First, he added a little oil to the water and then he told me to set two timers. The first was set for 11 minutes, and the second for 1 minute. He simply said, “Pasta 1-2-3”. My confusion, and curiosity, immediately wondered where this was going. As the pasta was added to the rolling boil, both timers were started. When the 1 minute timer sounded, he instructed me to stir the pasta and loosen it from the bottom and sides of the pot, then to set the timer again for 2 minutes. Two minutes later, I was to stir the pasta again and then set the timer for 3 more minutes. Another 3 minutes went by and I was to stir the pasta again, followed by making sure the colander was ready in the sink. Once the 11 minute timer went off (which had been continuously keeping track of how long the pasta had been in the water), the pasta was ready to be pulled, just a bit al dente, then drained and rinsed (with cold water). The point to this little exercise was to learn to keep reminding myself to stir the pasta, so it didn’t stick together or to the bottom of the pot. Stir at 1 minute, stir after another 2 minutes, stir again after 3 more minutes. Further, rinsing the pasta with cold water stopped the cooking process, sped up the cool-down time, all the while washing away any residual sticky starch on the pasta. Seven pounds of mac later, because the pot had been stirred, none of it was lost to the bottom of the stock pot, nor was any of it stuck together in a gluey-gooey ball. Once the noodles were completely cooled, they were covered, chilled and stored in the refrigerator overnight, ready to be simply heated up with the marinara sauce before lunch service the next day. One of the other things I have learned in serving food to kids, is how to market it to them. When the students came up to the window to pick up their hot lunch, their faces wriggled and grimaced with questioning stares as to what this new entree was. When we changed the name to “Pizza Pasta”, their faces lit up. We took their beloved mac-n-cheese noodles, and dressed them with marinara and melted pizza cheese, and dismantled their fears with a new name. Suddenly they fell in love with the new menu item and asked that it be served again.Pizza Pasta is now officially part of the menu cycle and will be making its return next month on the school lunch menu.